Rap battles have become a Russian cultural phenomenon. Pictured: Alexander Timartsev (aka Restorator). Over the past four years the Versus Battle YouTube channel has attracted 2.7m followers and its videos have racked up over 300m views. Rap battles have become a Russian cultural phenomenon, even foreign rappers from the U.S. are struggling to keep up with the Versus stars. St. Petersburg’s central facades are undoubtedly stunning and hark back to an era of unrestrained spending and grandiose design, but pull back the curtain and you’ll find a different, altogether shabbier world. Take one of the courtyards behind Ligovsky Prospekt for example, where exposed, crumbling brick walls, graffiti, dirty uneven streets, and lengths of rusting barbed wire give the impression of a Russian favela. Tourists are rarely seen here, and for good reason. But in one of these courtyards, not far from a private psychoneurological clinic, there’s a small bar called "1703" (the year St. Petersburg was founded). Just four years ago only friends of the owners knew about it – in the evening they discussed football, listened to the latest trending rappers, and spoke about life. Now the situation is very different: 1703 is the city's best known bar, topping Google searches. It’s there, in the warren of buildings behind Ligovsky Prospekt, where some of the most popular videos on Russian Youtube are filmed. Why did Versus become a superhit? Early in 2010 Alexander Timartsev (aka Restorator) rose to prominence on the St. Petersburg rap scene after taking part in the so-called Huyaks rap battles. These battles were pretty primitive – two rappers would square up to each other and try to get the better of one another with lyrical putdowns. Their rhymes were usually invented on the spot, which meant the semantic meaning sometimes suffered: The rapper had to think fast and make sure his words rhymed, so it wasn’t always entirely coherent. Restorator wasn’t happy with the format and suggested it be updated. He said the rappers should be given time to prepare, to write and learn the text before standing opposite their opponent and dishing out the dirt. And so it was. The winner was determined by three judges, people involved with either rap, poetry, or the Internet. The event was called Versus. As the first competitors, Restorator chose Garri Topor, a fledgling but very aggressive rapper from St. Petersburg, and respected performer Stim (St1m) – aka Billy Milligan. In August 2013, the two opponents turned up at 1703. Apart from them, only acquaintances of Restorator gathered. Before the start, the organizer recorded video interviews with the participants, and the show proceeded: Topor was brilliantly prepared and smashed Stim, who had forgotten his words and didn't expect his opponent to be so good. The whole event was recorded on camera, beautifully edited and posted on YouTube. The result was hundreds of thousands of views – interest spiked rapidly in this fresh format. Several factors contributed to the success of the enterprise. First, Topor combined humor, anger, and technical rap in his verses. Secondly, people were automatically attracted to the figure of Stim. Thirdly, Russian rappers supported Versus by endlessly reposting the videos. "There used to be either freestyle battles or offline battles, when a rapper had two weeks to record an independent track slagging off his opponent. In other words: Boring. And on Versus it’s possible to watch a rapper's actual performance – this is very important. 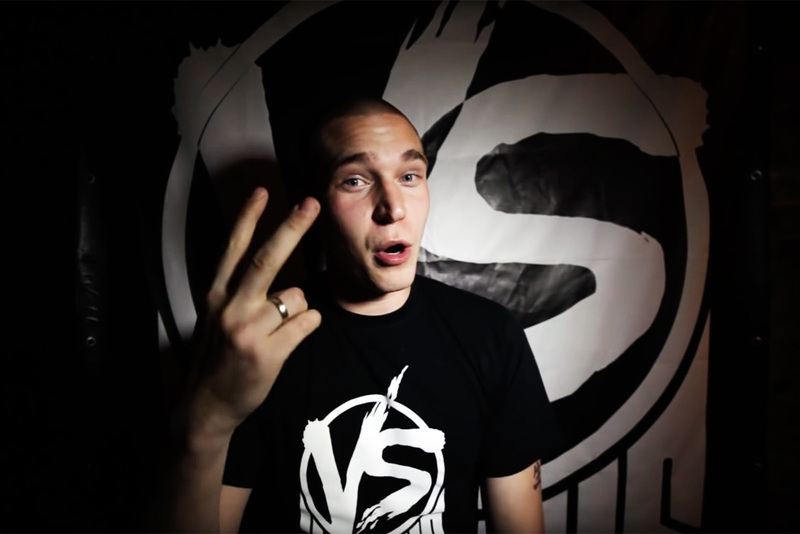 Incidentally, before Versus there were already attempts to do such battles but non-battle rappers like Stim were not invited. I think Versus shot to fame to a large extent thanks to the well-known rappers," says Garri Topor, a man who became famous throughout the country after his victories in the battles. Why is Versus better than American battles? The Versus project's triumphs alternated with failures. Even now, not all videos from the first 10 battles have passed one million views. To keep the bar high, Restorator attracted a rapper who uses the nick Oxxxymiron (Miron Fedorov). By that time (2013-2014) Oxxxymiron had already been gathering audiences of thousands and was in contact with other popular rappers. Oxxxymiron acted as a producer and convinced more rappers to participate in the battles. As a result, Vitya SD, Noize MC, ST, Johnyboy and other figures notable by Russian standards came to 1703. While focusing on the lyrical skills of the participants, Restorator knew that viewers quickly get tired of repeated formats. In a bid to prevent the competition from becoming boring, he experimented. In the spring of 2014 battles were held in clubs in a tour format – from St. Petersburg to Novosibirsk (3,366 km from Moscow). Then there was a league for promising newcomers called Versus Fresh Blood. Subsequently, Restorator invited bloggers to 1703 who had nothing to do with rap but had a huge following on YouTube. For example, the video of the battle between Yuri Khovansky and Dmitry Larin has over 28 million views. In the United States, battles are held spontaneously, the video is often blurred and technical rap no longer surprises anyone. Restorator says the huge popularity of Versus is down to the scrupulous attention to the product’s production quality. Objectively speaking, the Russian project has more trump cards. Local battles are like a show or theater. For instance, participants regularly take props with them, and Oxxxymiron had a tattoo of the date "1703" made specially for his fight with Johnyboy. Naturally, the key lines from Oxxxymiron's performance were devoted to this tattoo. In America, they do not do such performances – they just recite rap. How much money does Versus make? In the first three seasons (2013-2016) Restorator's project "broke even.” Renting a room and shooting and editing video ate up all the money that came from sponsors. Now that all videos consistently collect more than a million views, and the top videos more than 10m, the money earned from advertising is by no means meager. According to our information, for a mention in one video, bookmaker Leon pays the organizers a million rubles ($17,800). Nevertheless, battles still take place in the modest but cosy 1703 bar and only those who have at least some relation to the rap movement are let in. Once Restorator refused entry to someone offering 50,000 rubles ($900) because he didn’t think he was a suitable audience member.